PCCW Media recently upgraded its ‘Now One’ 4K set-top boxes with new software that will significantly improve their performance and the resulting user experience (UEX). The Hong Kong multimedia and entertainment group – and IPTV pioneer – avoided the cost and disruption of deploying new hardware. Instead it installed the Enable software stack from Amino Communications and is implementing its own next-generation user interface, the UX3, on top of it. In time, PCCW will port Enable to its installed base of legacy devices. Until recently the Enable software was only available on the whole-home gateways and thin client set-tops sold by Amino. Now it can be licensed for use on third-party hardware and PCCW is the second Pay TV operator to take advantage of this development. Cincinnati Bell, the North American telco, is also integrating the software with its legacy IPTV set-top boxes and its own choice of middleware. Once again, the result is improved performance and UEX, including some advanced applications. “We are delighted to present our subscriber base with a fresh user interface and new media choices without the time-consuming logistics associated with a complete hardware replacement,” Tom Simpson, Chief Technology Officer at Cincinnati Bell, said when the deal was announced in February. His company is reaping additional rewards in the back-office where improved operations are reducing customer care issues. As Donald McGarva, CEO of Amino Communications, points out, Enable was designed in such a way that it can be ported to a wide range of hardware platforms.. It means operators can update their TV user interface, application and DRM on legacy devices without the cost of new set-top boxes and truck rolls. He emphasizes the high performance of the Enable software, which provides for ultra-fast channel change and very high quality pictures, among many other things. These software-only wins are a significant milestone for Amino, providing more evidence of how the company has evolved from an IPTV set-top box provider to an all-round TV solutions provider. Thanks to the acquisitions of Entone and Booxmedia last year the company now has (respectively) the hybrid QAM-IP capabilities to support the cable market in its transition to IPTV plus a multiscreen platform that can be used for operator TV Everywhere or direct-to-consumer (OTT) broadcaster services. The Booxmedia capabilities – now marketed as the Amino MOVE cloud-based TV software platform – include media ingest, encoding, transcoding, DRM, service discovery and CRM integration. The platform is architected to support a wide range of client software solutions, including those supported by traditional middlewares as well as OTT devices. MOVE is used by DNA Finland for its TV Everywhere offer and in May the Dutch utility company and television provider DELTA migrated its whole OTT solution to MOVE in order to radically upgrade its multiscreen offer. The Belgian broadcaster RTL is another MOVE/Booxmedia customer, using the platform for its ‘RTL a l’infini’ service, which among other things includes transactional and subscription VOD. Across its TV markets, Amino provides whole-home hubs and thin clients to deliver Pay TV onto every screen in the home. As further evidence of its growing software portfolio the company also offers a service assurance suite to manage QoE and help to pre-empt customer care issues. 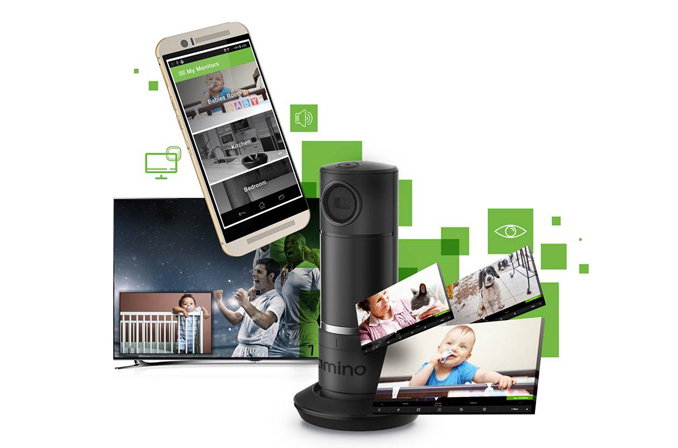 And in an effort to help its Tier 2 and Tier 3 customers grow revenues – something that is particularly appreciated by those who are seeing their video margins squeezed – Amino now offers its Fusion smart home software to provision and then manage home monitoring services. The acquisition of Entone did not only bring a broader product solution; it delivered 100 extra software engineers and the scale to compete with larger vendors. The PCCW deployment can be viewed in this context. Amino is still targeting T2/T3 operators but according to McGarva, this deal shows that the company can meet the needs of the T1 market. Set-top boxes are still at the heart of the business. In January Amino unveiled its 6 Series range of 4K Ultra HD ready devices with HEVC processing. These include a DVR gateway with dual 720p30 transcoding to support multi-screen around the home, and an accompanying client device. Both these devices include 802.11ac (4×4) Wi-Fi and MoCA networking options. The 6 Series also includes a hybrid (broadcast and IP) HD HEVC client device and a cost-effective IPTV client. The company now provides the former Entone hybrid devices of course; Vodafone Netherlands recently announced its continued roll-out of these IPTV set-tops for its fibre and DSL-based TV services. Looking ahead, McGarva expects the majority of gateways and whole-home clients to be thin-client devices, albeit it powerful ones that ensure high availability and which can cope with network latency in an increasingly cloud-centric world. “That will suit us well because we have always delivered thin-client devices,” he declares. All gateways and STBs will eventually be hybrid in some form and will never be replaced by Smart TVs, he argues. Hard drives will eventually give way to network DVR. Amino’s core T2/T3 market will deploy 4K/UHD but will expect a premium for it and HEVC will provide the bandwidth efficiency to make it possible (and enable them to deliver more HD and reduce operational costs). McGarva makes it clear that small and mid-sized service providers, including rural North American telcos that Amino has sold into so effectively, are innovators. Some market themselves based on great local customer service and others compete on price, while some make product innovation their priority. All of them have to keep an eye on what the Pay TV giants are doing and find a way to differentiate themselves. It is a realistic ambition for these smaller providers to offer a TV Everywhere service that is competitive against their key competitors, mainly satellite operators, and wider innovations from the likes of Comcast, the Amino CEO believes. Nobody has deployed the perfect TVE service and most are missing channels or local channels, or catch-up services from important broadcasters, or network DVR. The T2/T3 market can definitely compete on the multiscreen user experience and also time-to-market, he claims. With more resources and more software capability, Amino is expanding its partnership role with these small and mid-sized operators. The company believes it can lower the cost and risk associated with bringing new services to market, with TV Everywhere being one obvious example. And more services is precisely what this T2/T3 market is looking for. In a growing number of cases, Amino customers are keen to exploit their fibre broadband and offer value-add services before third-parties beat them to it. This is leading some of them into the smart home, with an eye on the wider IoT opportunity. McGarva points out: “They have all dealt with the OTT video challenge. They do not want that to happen again in the smart home market – where they provide the broadband, someone goes to their electronic store to buy a security camera and service and then soaks up their broadband before complaining that the capacity is not good enough. This explains why Amino has created a smart home software platform that can be used with its existing gateways and set-top boxes and other hardware, like security cameras. Amino Fusion is a hosted service that works across DSL, fibre, DOCSIS (cable) and cellular networks. In August the company unveiled Fusion Home Monitor, which provides service providers with self-installable Wi-Fi cameras and operator-branded mobile and web applications to accompany them. The camera includes motion detection and records both video and audio into a DVR or the cloud. This whole service is viewed as a churn-buster and revenue generator, with cloud-based video storage one of the ways to monetize it. The home monitoring is integrated with the television service so you can list a camera as one of your STB channels. If the doorbell rings while you are watching TV you can have a ‘picture-in-picture’ pop-up to show you the doorway, for example. This is a capability that ‘OTT’ home monitoring providers would find hard to match. “The beauty of Fusion is its simplicity, especially compared to past generations of connected home services that involved truck rolls and houses full of proprietary sensors. Fusion Home Monitor is a single device delivered in the mail, allowing consumers to be up and running with a new billable service in five minutes,” Amino noted when announcing the new offer. McGarva is determined that service providers should remain the portal through which consumers get their entertainment and many broadband-related services. This means providing connectivity into different network types and content services (the PCCW ‘Now One’ set-top box is ultra-hybrid, supporting the Now TV IPTV service, DTT signals and OTT content, including from onboarded partners like Netflix and via Android apps). It also means providing the hub and connectivity for the smart home. A final piece of the jigsaw, also enabled by Amino, is ensuring the Quality of Service (QoS) to support whole-home TV and smart home services. This requires great Wi-Fi, among other things (thus 4×4 MIMO capabilities in the Amino 6 Series). The company also offers the Engage Service Assurance Platform to monitor the home network and devices. This anticipates trouble and helps operators resolve any quality issues. The more IoT devices come into the home, the more service providers may need this kind of capability. A recent customer win illustrates some of what Amino has tried to achieve with its acquisitions and new strategy, and the markets it plays in. Ohio (USA) based triple-play provider MCTV is small (with 47,000 home and business customers) but ambitious. It is transitioning its cable services to IP. MCTV prides itself on great quality services. The company is deploying Amino Kamai 450m and Amulet 455m devices, enabling multi-room video, streaming services and reliable home networking, plus service assurance with Engage. MCTV is also deploying a multiscreen offer called ‘watchTVeverywhere’, supporting mobiles and tablets. From MCTV in Massillon, Ohio, to PCCW in Hong Kong, everyone needs to innovate and everyone needs partners who have the capabilities and the time to support them. For a growing number of operators, says McGarva, that partner is Amino. Photo: The Amino Fusion Home Monitor lets service providers offer home control services and monetize the Internet of Things.